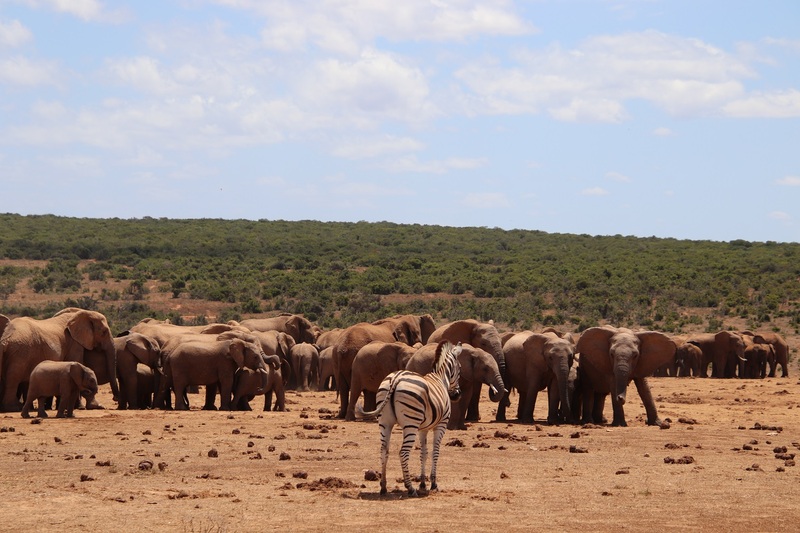 Despite its name, one cannot be guaranteed to see a lot of elephants – or even any elephants – whilst driving around the Addo Elephant National Park. 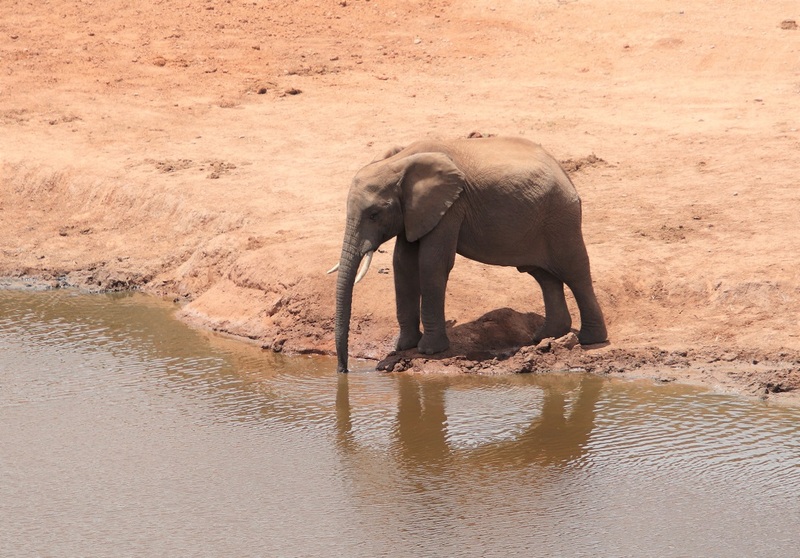 Sometimes one feels fortunate to see a lone elephant, such as this one, wading through the shallow water in the Ghwarrie Dam or drinking quietly with only water birds for company at first. Note the thick, dark mud sticking to its tusk. 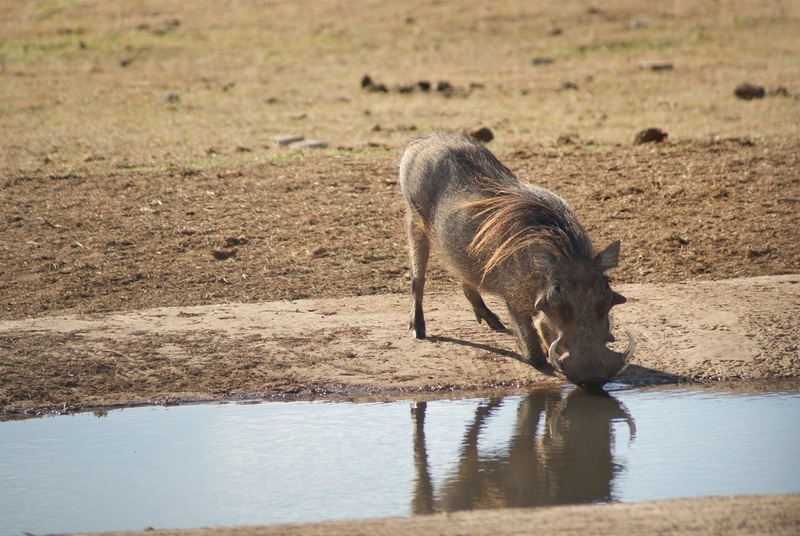 It was later joined by a lone Cape buffalo that wasted no time in wallowing in the mud. 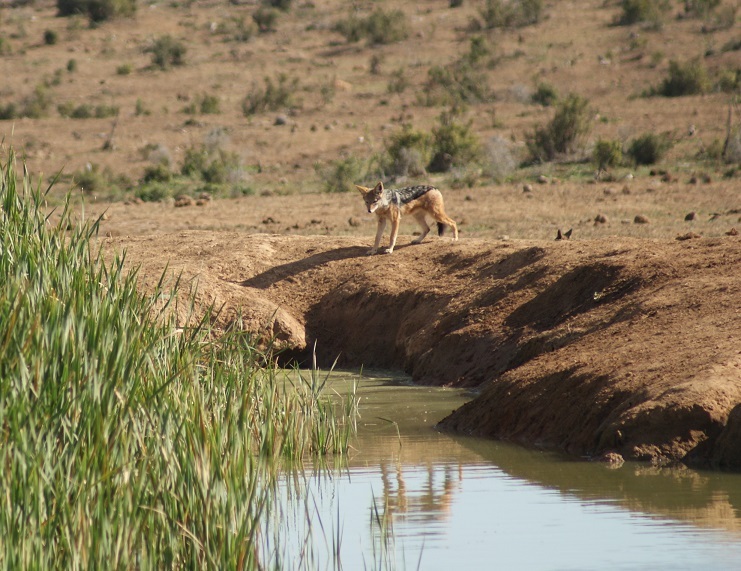 The situation at Rooidam was different, for here a small herd had gathered, waiting patiently while a young one found a deeper hole in which to wallow. It sometimes submerged itself so completely that only the tip of its trunk showed above the water. 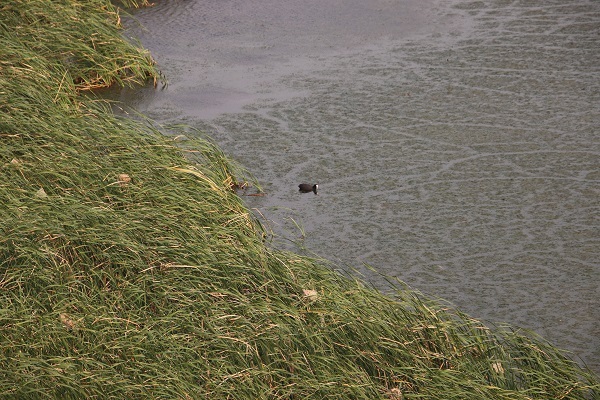 You can see, from the elephant on the right, how shallow the water is for some distance from the edge. You will notice that most of the other elephants have already covered themselves with mud or sand, which helps to protect their skin from the harsh rays of the sun (as we would use sunscreen) as well as from parasites. 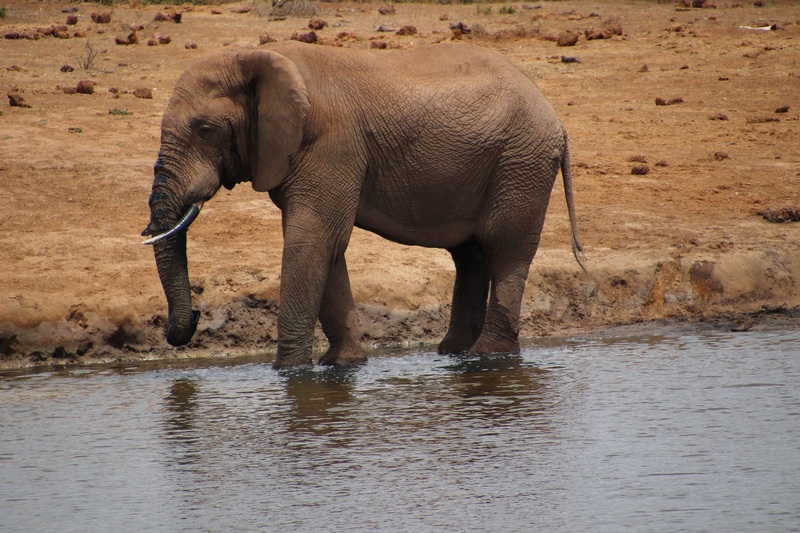 At Domkrag another elephant cut a lone figure as it drank thirstily from the dam. You can tell from the shadow beneath that the sun was high. A strong hot breeze was blowing too which added to the discomfort of the thirty plus degrees heat. 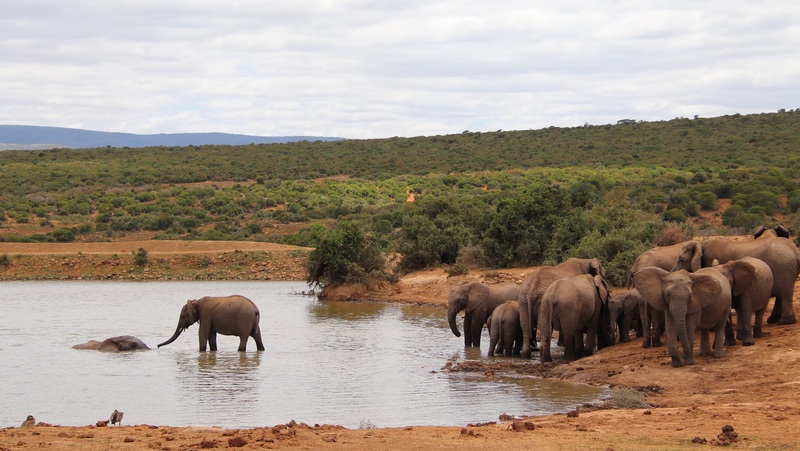 No single photograph can capture the hundreds of elephants gathered at the popular Hapoor waterhole. Far too many vehicles were parked cheek-by-jowl along the edge of the main watering place for another to get in, so these two photographs show a small section of the hundreds of elephants gathered on the other side of that waterhole where, presumably, there must also be access to watering points. Note: you can double-click on these images for a larger view. 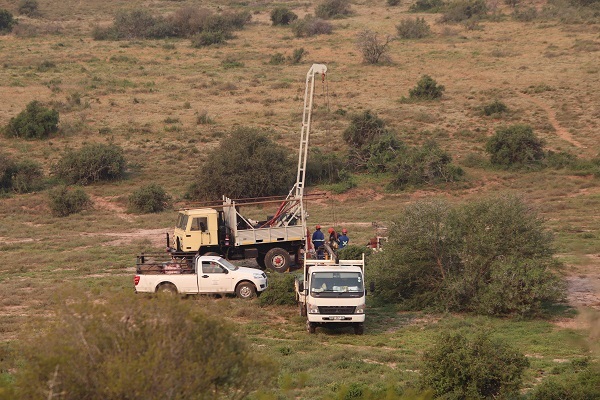 I wonder how many tourists give a thought to the multitude of jobs that happen behind the scenes in a game reserve that are ultimately for their benefit. The people one sees daily are those who clean the ablution blocks, who keep the chalets or camping areas clean; those who tend the gardens perhaps as well as those who work in the shop. Then there are the people who keep the restaurant going and the gatekeeper who checks one’s permit before one can enter the game viewing area – and those who operate the entrance/exit gates … I suspect their contributions are largely taken for granted. 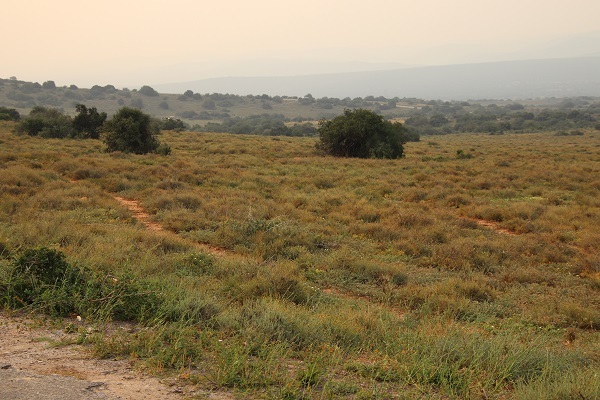 What about the man with the back pack, a rifle and an Alsatian we sometimes saw around the car park and the day visitor picnic area – he says he is on the lookout for clues relating to rhino poachers. There are people who are involved with game management from the air. 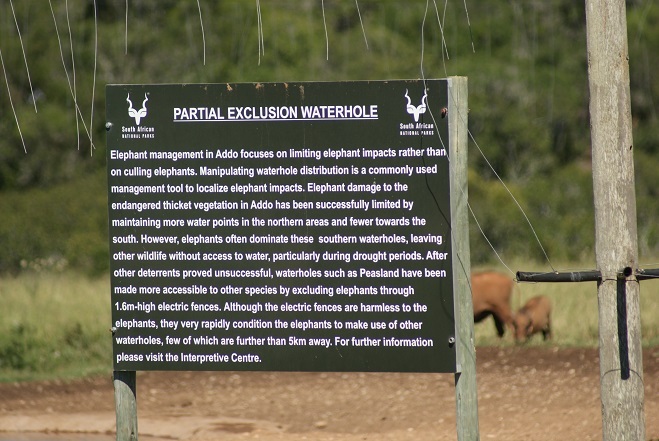 Then there is the management team that has had to consider the impact of herds of elephants dominating the waterholes, preventing other animals from having access to water; that came up with the idea of partial exclusion waterholes. 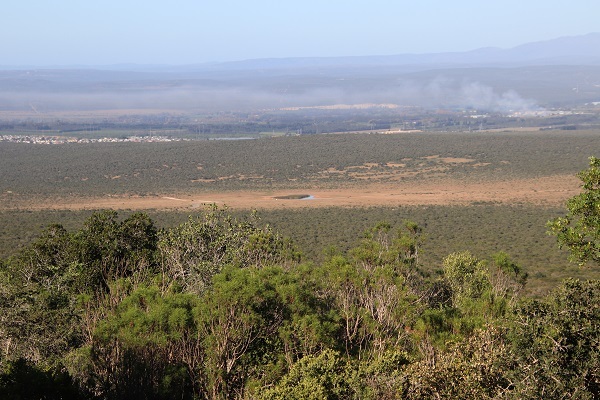 As there are no rivers running through the Addo Elephant National Park, there are no natural open water sources, except when hollows fill with water after a particularly good rain. 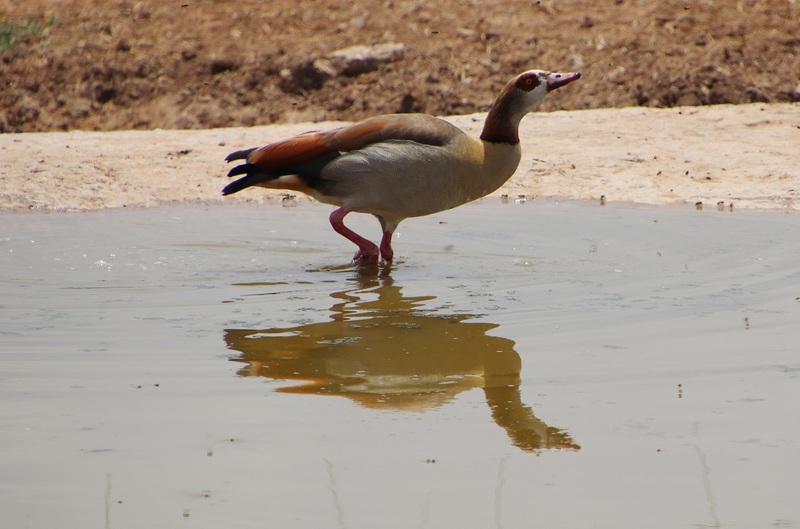 All the waterholes have been artificially created with water that has to be pumped from boreholes. 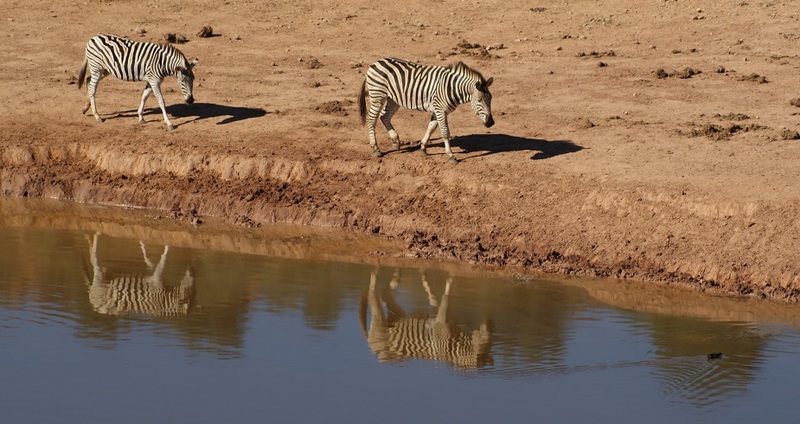 These waterholes have to be managed. 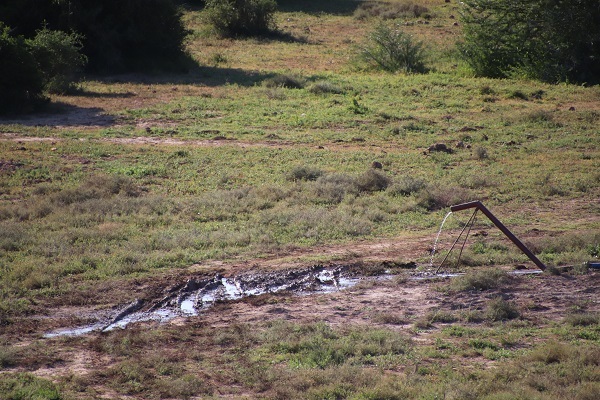 When you look at this view of the popular Hapoor waterhole and see the impact the gathering of large herds of elephants (and other animals) has had on the veld you can appreciate why some waterholes have had to be protected. 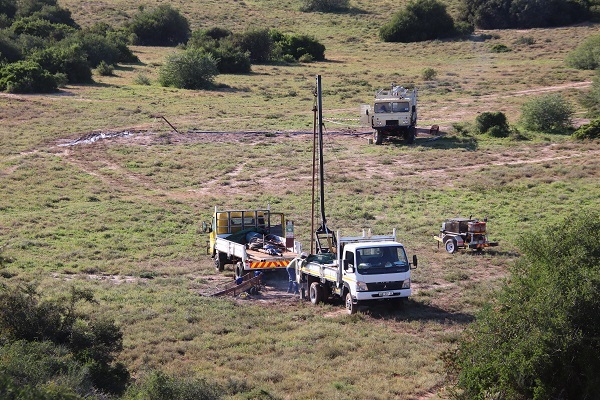 We noticed a borehole rig operating below that dam wall at Domkrag. That they had struck water became obvious the following day. On our last morning in the Addo Elephant National Park we came across a group of men patching potholes in the tar road in the Woodlands area. 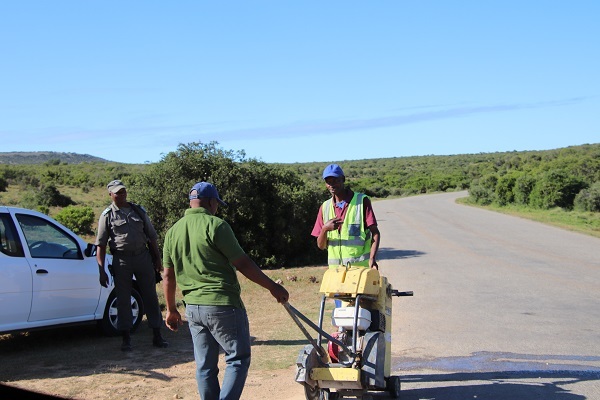 These, and so many other ‘invisible’ people help to ensure that tourists have a good time when visiting game reserves all over the country. 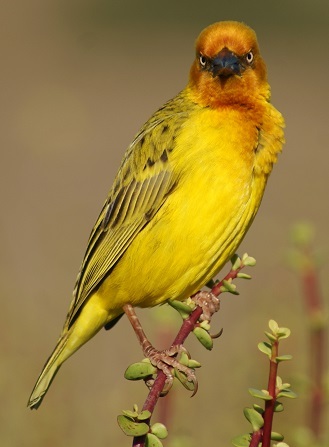 Give them a thought and a nod of appreciation when next you ‘head out for the wild’. 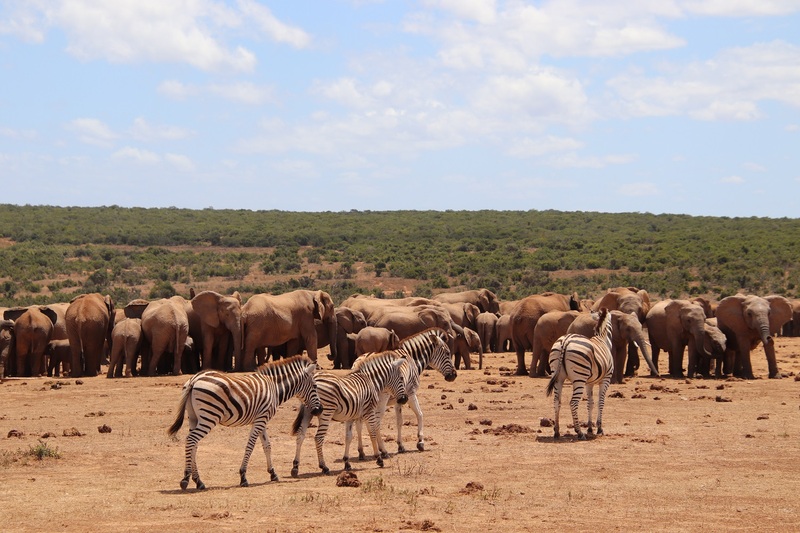 The camp sites in the Addo Elephant National Park are so popular – even during the week and out of the traditional ‘holiday seasons’ – that one has to book way ahead. As the time approached we scanned the expected weather daily: cold and rainy … cold and rainy … then our day of arrival was forecast to be warmer and dry: good for pitching the tent at least. The day before we left the temperature had risen to 46°C and all signs of rain had disappeared. 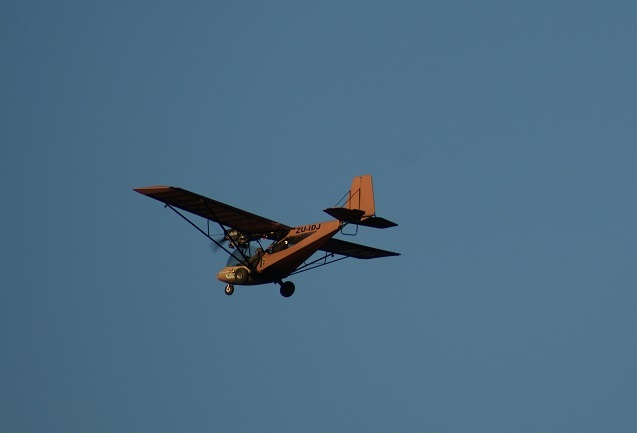 We had not bargained for either the strong wind or the smoke and dust-laden air that filled the sky at least from Port Elizabeth to Grahamstown. What should have been a twenty minute job of setting up camp became longer: the ground was so hard that we had to drill holes to get the tent pegs in; the wind whipped every corner of the tent and flysheet and shook it; the tent billowed and guy ropes were whipped out of our hands even as our eyes filled with dust and grit and the smoke from veld fires assailed our nostrils. 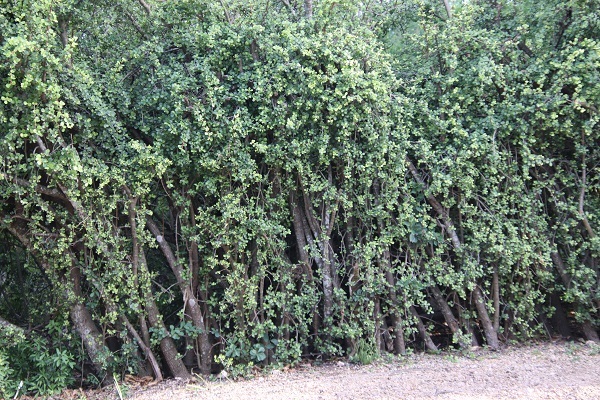 Thank goodness for the thick hedges of Spekboom planted between the camp sites: they not only provide a degree of privacy for campers but afford some protection from the wind. At Domkrag the reeds swayed and bent in the strong wind which shook the carefully woven nests without mercy. 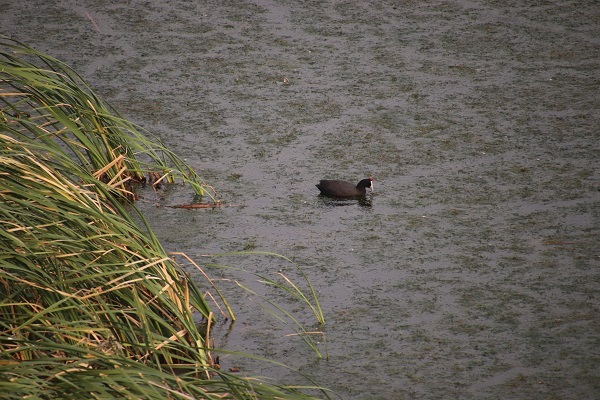 A Red-knobbed Coot (Fulica cristata) battled its way through the water weeds as the wind swept down the hill and buffeted all the water fowl that dared to be out on the open water. 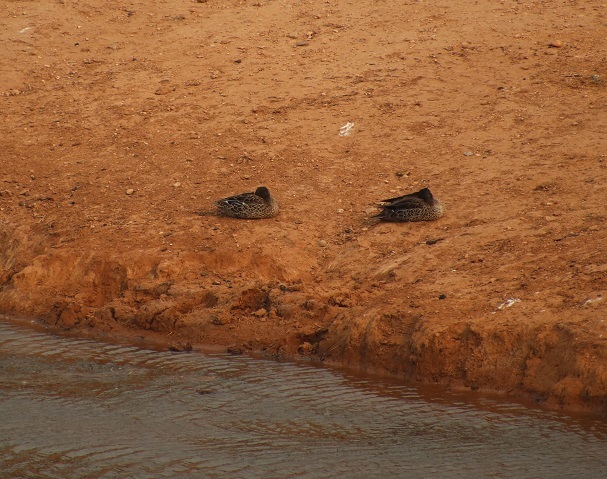 Others, like this pair of Yellow-billed Ducks (Anas undulata) sat on the bank with their heads tucked well in. 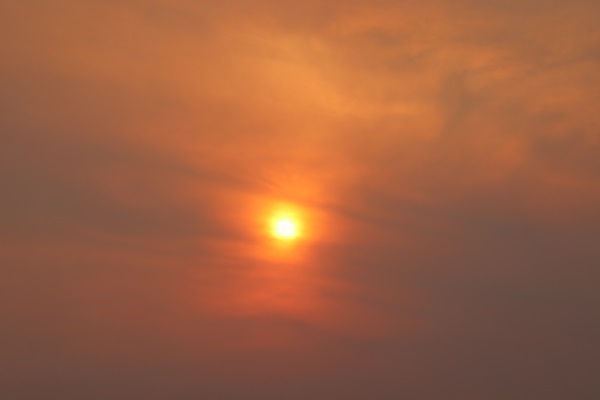 The late afternoon air was thick with smoke and dust. 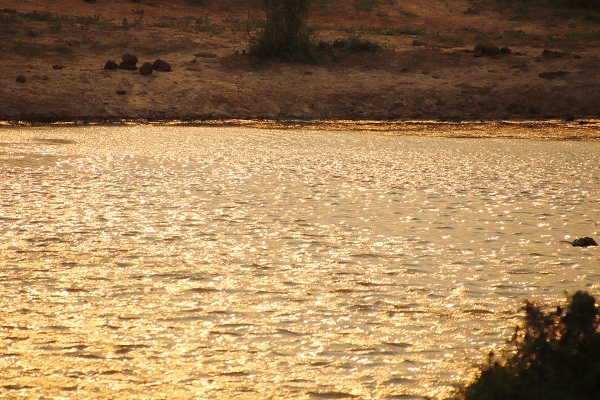 With the bonus of a dramatic sun approaching the horizon, casting its golden glow on the surface of Ghwarrie Pan. My wish for you all is a year filled with interesting and joyful times; that you will have time to observe the uniqueness of nature; make time to enjoy the company of friends and family; and that you will enjoy the fulfilment of a life well lived. Thank you for having joined me on my discoveries around my garden and elsewhere. Happy New Year! The Cape Robin is – as many of you know – regularly seen in our garden. 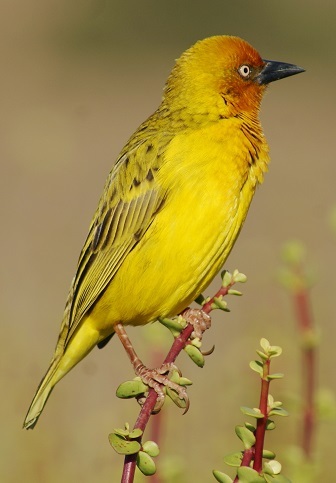 It breeds here quite successfully and brightens most early mornings with its beautiful melodies. 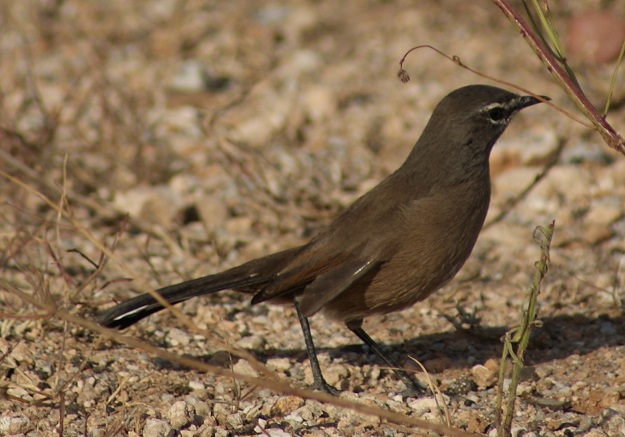 Another pretty robin – although many describe it as being drab – is the Karoo Scrub Robin which prefers more arid areas and so we have to travel to the Addo Elephant National Park if we want to see one. 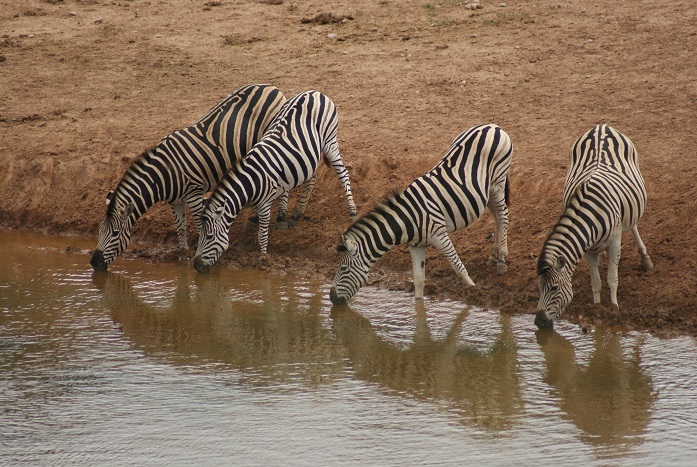 There we can be assured of spotting at least one of them at the Domkrag waterhole. 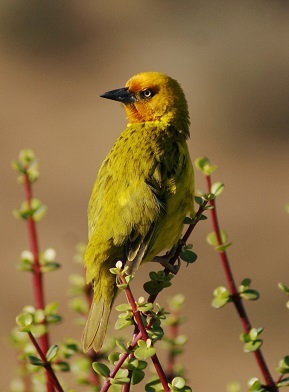 They boldly hop around in front of the Spekboom hedge and can often be seen eating ants, catching beetles or even flies – quite unfazed by the visitors peering over the hedge at the birds and animals that may be at the waterhole below. 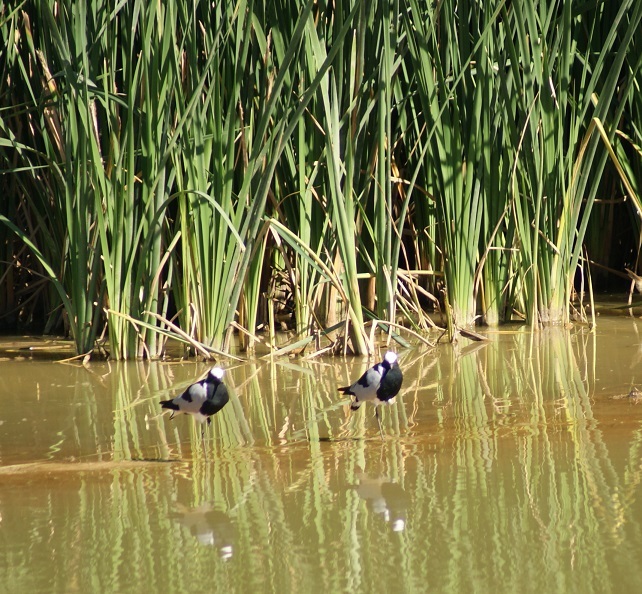 It appears to be quite tame, although flies away if one approaches too close.